Snowing heavily in the Philly metro region. Just snapped the following image . 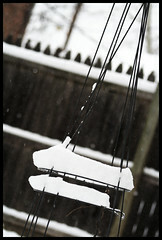 Appears to be a couple inches already accumulated, with an onslaught still predicted. I just defrosted my freezer. Sadly, it was thicker than that.